This year, my observing project is to recreate as many of Galileo’s original telescopic observations as I can. I’ll be using my smallest telescope, a 70mm refractor, and making my sketches using a 25mm eyepiece for a magnification of 19x. Each of my lunar sketch pages will each show three sketches on the page. My first sketch is an “outline” of major features. The second sketch shows more detail, and the third is the final sketch. When I’ve matched all of Galileo’s lunar sketches, I’ll make a comparison montage. The three-day waxing gibbous moon is high enough above the western horizon and far enough away from the setting sun to be easily visible. Earthshine illuminates the unlit features, and sun shines on the narrow crescent. Mare Crisium (the Sea of Crisis) is the oval dark geological feature visible on the lower right edge of the three-day-old crescent moon. The crater Picard can be seen within the smooth surface of Mare Crisium. Along the terminator are some distinctive craters and other features, visible even at 19x. Following the terminator from right to left in my sketch, are dark Mare Fecunditatis and the large oval craters Langrenus, Vendelinus, and Petavius, all partially lit by the sunrise on their walls. Petavius, the third of the 4 evenly spaced, and similarly sized craters shows some of the prominent crater floor structure of central peak and rimae – which I sketched as a dark angluar line. Funerius, fourth and last of the big craters on the terminator tonight, are near the two smaller craters, Snellius and Stevenius. In my sketch, I just show the crater floors flooded with shadow. Earthshine reveals Mare Imbrium and Mare Serenitatis, Nubium and Humorum. And I was able to see the crater Aristarchus (the white feature top middle of the earthshine) and Plinius and Linne — the small white features in the lower middle of earthshine. Use the link below to Hitchhikers Guide to the Moon to identify other features. 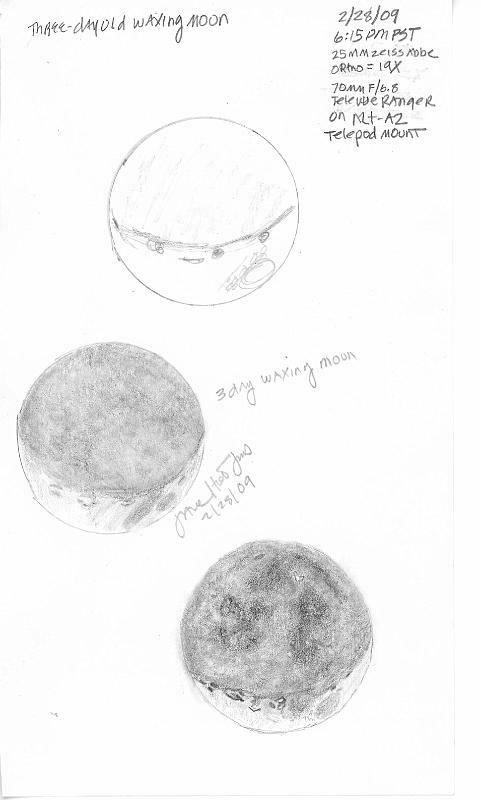 Sketch of Langrenus, Vandelinus, Petavius, and Furnerius a few days after full moon February 3, 2007, a 16 day-old waning moon.